A chrome plated wrench for use with standard 8-32 VEX EDR nuts. 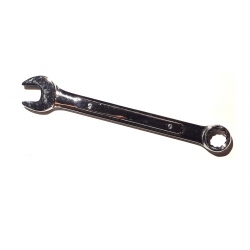 This wrench is actually 9mm (a more common and inexpensive size than 11/32"), which is 0.27mm larger than a VEX EDR 11/32" wrench. These wrenches still work perfectly on any nut with their open end, but we don't recommend the box end, particularly on aluminum nuts, However, this is still a great tool at an unbeatable price.